I made this casserole a few weeks ago because it was voted Casserole of the year by Taste of Home Magazine. Plus lets be honest, I never met a Mexican dish I didn't love! This casserole certainly did not disappoint and the best part it was so simple to put together. If you are a Vegetarian I think this would be great without meat and you could just add another type of beans or an additional veggie. I also think it would be great with ground turkey or shredded chicken if you don't like red meat. It was cheesy and filled with so many great flavors! I love making casseroles because I can make them earlier that day and then just pop them in the oven. I usually make them during nap time and then I have more time to spend with Sterling and Matt when he gets home (and more time to sit and sip my glass of wine). I highly recommend this, it was super tasty! 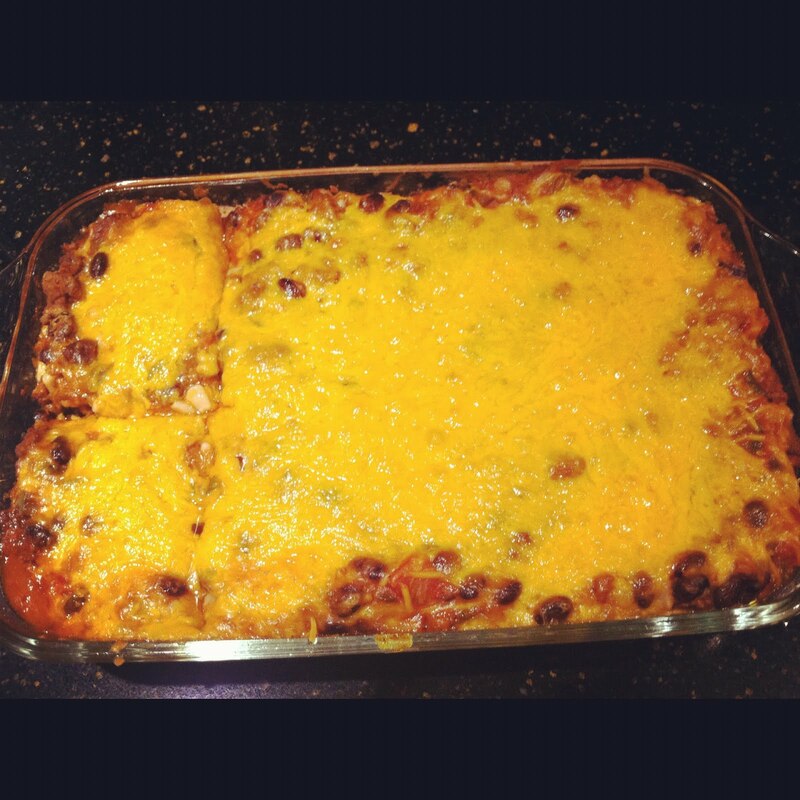 I promise it tastes better than my sad picture looks, but wanted to show you our "real life" picture of the casserole. • *Note: I cut the flour tortillas to fit my pan, since they were the very large size. I also added in a can of refried beans to the mix because I love refried beans. It is not in the original recipe but I thought it worked perfectly. •In a large skillet, cook beef and onion over medium heat until meat is no longer pink; drain. •Stir in the salsa, beans, corn, dressing, sour cream, taco seasoning and cumin. 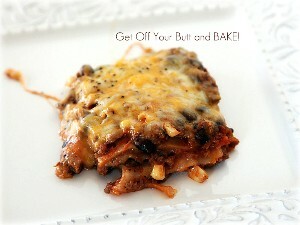 •Spoon a generous layer of meat mixture on bottom of 2 quart baking dish. Sprinkle with grated cheese. •Place a flour or corn tortilla on top of meat mixture. Layer with half of the meat mixture, and cheese. Repeat as many layers as you like. •The last & final layer should be a healthy dose of grated cheese. •Cover with foil that has been sprayed with pam or other and bake at 400° for 25 minutes, or until hot & bubbly. I just made this last week! We thought it was delicious as well! love, love, love this recipe..I make it with shredded chicken as well!! MMMMM cheese and beans, my fave!! We'll have to make this stat! That looks delicious! I'll have to try it! And thanks for adding in when you squeeze in the time to make all these delicious meals! I need to take nap time to do that too and save other chores for when the kids are awake. SAWEET! I am totally making this. I love your family style recipes! Alright this looks really good too, mmmmmm. Hungry again. I literally started to drool when I saw this...Yum, I know what will be for dinner tomorrow. Thank you. this looks amazing! kip and I do taco thursdays, but I keep wanting to switch it up and this may be just the thing. your pics looks just as delicious! Girl...you know I love me some Mexican!! This looks amazing! I will def be trying this out!!! Thanks for sharing! This looks delicious! The salad dressing threw me off a little, but I trust you! 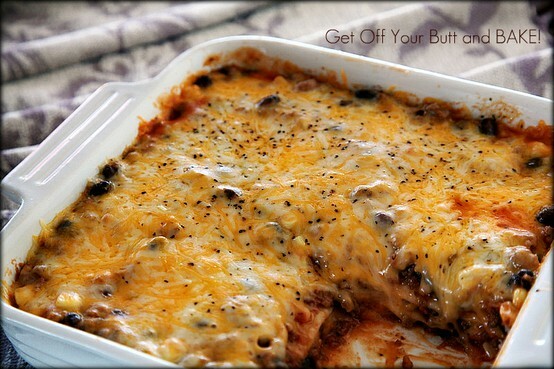 Post Lent, I'm making this with Morningstar veggie ground beef!